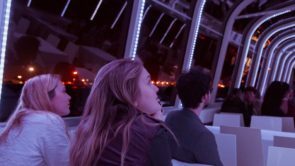 An Immersive Experience That’ll Float Your Boat! 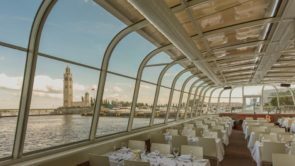 Le Bateau-Mouche in the Old Port of Montreal is a tourist destination par excellence. 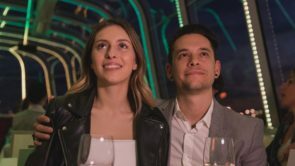 Launched in 1992 for Montreal’s 350th anniversary, Le Bateau-Mouche has become one of the city’s most popular attractions, with dinner cruises boasting an unbeatable view of the city skyline. 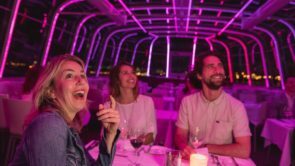 In celebration of its 25th anniversary, which coincides with Montreal’s 375th, Le Bateau-Mouche added a new touch of magic to its evening cruises, with three immersive light shows, complete with an original soundtrack. 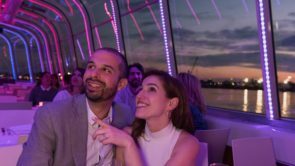 To make this one-of-a-kind experience come to life, the team at Le Bateau-Mouche turned to XYZ for its design, production and programming services. 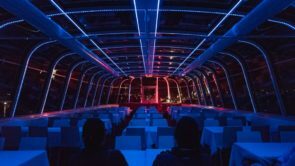 The XYZ team drew inspiration from the distinctive structure of Le Bateau-Mouche, installing LED lights on the metal frame of the interior. 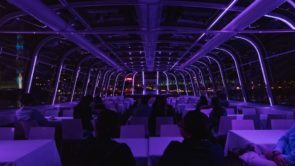 Under the guidance of music director, staging director and Bateau-Mouche team, XYZ’s creative professionals developed three ooh-and-ahh-worthy lighting schemes that unfold in sync with the specially created soundtrack to showcase the boat’s architecture. The resulting experience engages and delights in a very special way. 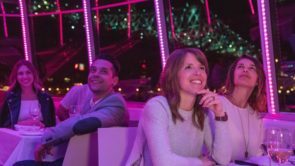 In addition to the new light and sound show, the expert integrators at XYZ upgraded the onboard audio equipment with a more powerful system. 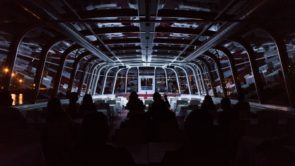 Improvements include discreetly positioned speakers to provide better boat-wide coverage, as well as wireless microphones and a sound console.